Think finding the Best Carbon SUP Paddle is hard? Here's our rundown of the top 5 carbon paddles on the market. 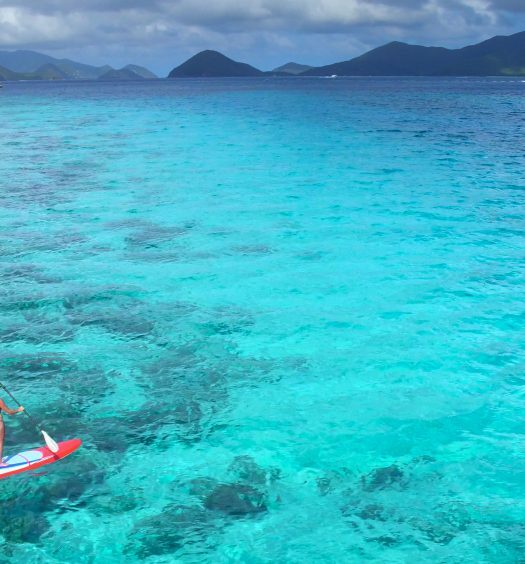 Among the wide range of water sports, stand up paddle boarding is one of the most popular. Stand up paddle boarding, or SUP for short, requires the use of a paddle to help maneuver you through the water. You can find SUP paddles constructed from everything from durable wood to lightweight aluminum. While each material has its own pros and cons, carbon SUP paddles stand above the rest. Carbon fiber paddles are considered top of the line. They’re manufactured using a very lightweight material but are still considered the strongest paddle material available. While typically more costly than other paddle options, carbon SUP paddles provide the best performance by far. 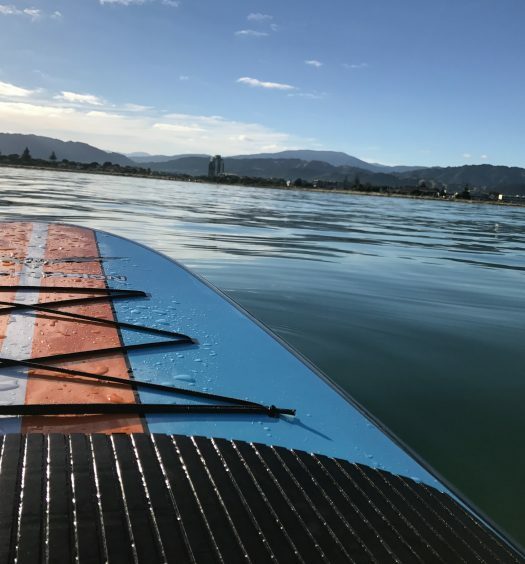 If you’re serious about SUP and are looking to purchase the very best paddle money can buy, you’ve found it with a carbon SUP paddle. In short, the best carbon SUP paddle is lightweight, powerful, and adjustable. 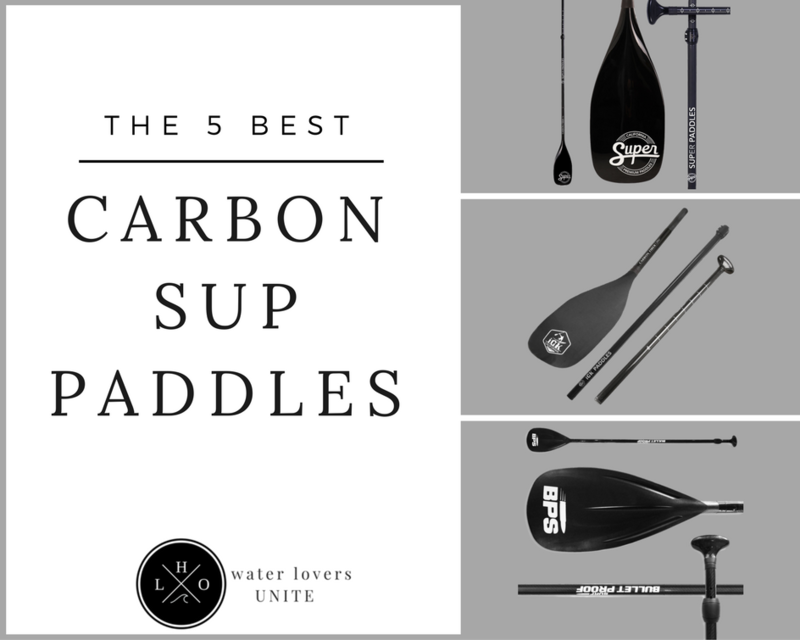 Let’s take a look at some of the top-rated carbon SUP paddles on the market today. Length: Pay close attention to the length of your paddle. A paddle that is too long will cause your arms to tire easily, while a paddle that is too short will force you to bend forward to reach the water. Blade Size: Choose a blade size depending on your desired activity. 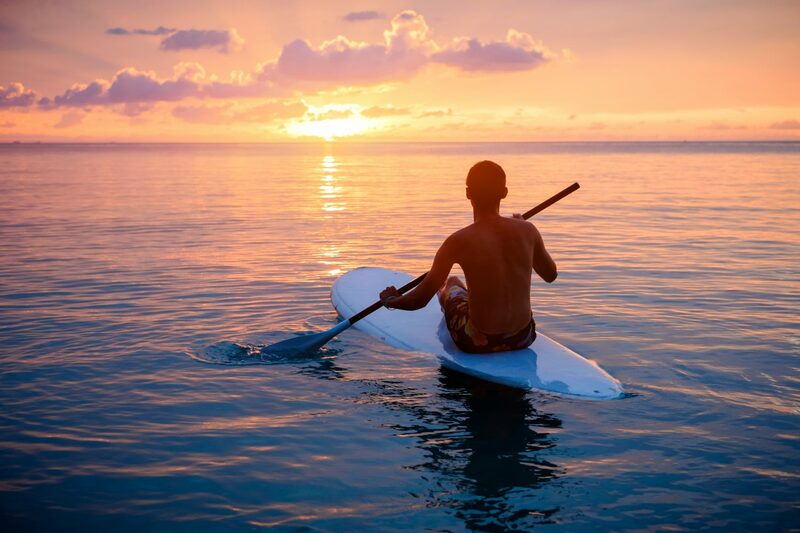 For example, a paddle with a small surface area is great for cruising as it puts less stress on the arms. Palm Grips: The type of palm grips you choose is ultimately personal preference, but it’s important to compare. With a T-shaped grip, you’re less likely to lose the paddle in rough waters. However, some paddlers prefer a ball-shaped grip. Storage: If you plan on transporting your SUP paddle, you may want to consider a three-piece paddle that allows you to store it in the same bag as an inflatable paddle board. If space is not an issue, any type of carbon paddle will do. 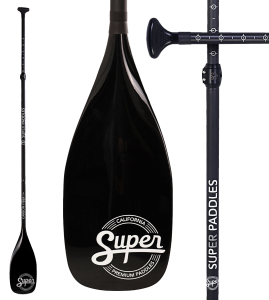 As far as three-piece SUP paddles go, the Super Paddles Carbon Fiber SUP Paddle can’t be beat. The high-quality carbon fiber paddle in available in bamboo and with your choice of a bamboo veneer, pure carbon fiber blade and shaft, fiberglass blade, or nylon blade. Best of all, the paddle is easily adjustable to suit all paddlers over 5-feet. What makes this one of the best carbon SUP paddle options is its high-quality construction. The paddle features a double concave and dihedral blade that helps to remove blade flutter and promote stroke stability. This paddle comes with its own paddle bag that allows you quickly to throw it over your shoulder and head to the beach. Whether you’re new to SUP or have mastered the sport, a carbon paddle is an excellent investment. 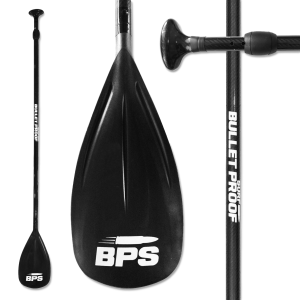 The BPS Carbon Slider SUP Paddle comes with a deluxe paddle bag and is easily adjustable. At just 1.7 pounds, this paddle is easy to take with you on all of your water adventures. The paddle features a super smooth carbon fiber handle, a nylon composite and fiberglass blade, and a heat reflective bag that prevents your paddle from succumbing to scratches or sun damage. It takes just seconds to set the paddle at your desired length and another second to lock it in place. Finding the perfect combination of weight, length, and performance is not always easy. 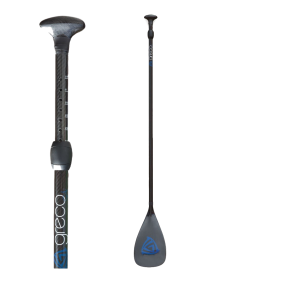 The Airhead Carbon Composite SUP paddle possesses all of these features and more. The lightweight, one-size-fits-all paddle has a length that adjusts between 160 and 210 cm. The stiff, lightweight carbon fiber is perfect for beginners who are new to the sport. 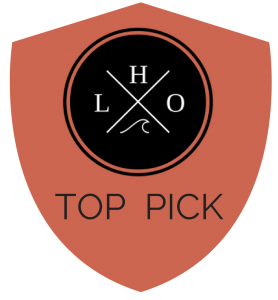 What makes the Airhead SUP paddle one of the best carbon SUP paddle options is its overall design. 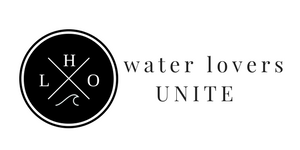 It’s lightweight enough to float on the water and durable enough to withstand even the roughest waters. With a 30-degree angle bend at the shaft, the paddle allows you to easily maneuver through the water. Very light – and floats too! If you’re in search of a sleek, professional looking SUP paddle to add to your water sports collection, the iGK is a superior option. 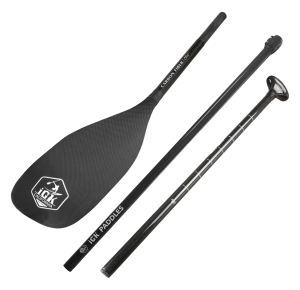 The iGK Pure Carbon Fiber SUP Paddle features a comfortable and ergonomically-designed handle. The double concave and dihedral blade minimizes blade flutter while adding stroke stability. What makes the iGK one of the best carbon SUP paddle options it its high performance qualities and adjustable size. The three-piece paddle adjusts from 72 inches to 86 inches, making it an excellent option for paddlers over 5 feet. It takes a mere 20 seconds to set up the paddle for use, and when you’re done, store it in the paddle bag. SUP is one of the fastest growing water sports in the world. Individuals who partake in the sport often look for high-quality paddles to help up their performance. The Greco Surf Carbon Fiber SUP Paddle is an excellent option for paddlers in search of a 100 percent carbon fiber product. The top-quality paddle is adjustable with a length that ranges from 67 to 85 inches. Weighing just 1.2 lbs., the paddle is a great option for easy travel and storage. The paddle features a double pinned locking mechanism and comes with a complimentary blade bag. Can’t Surf? Try SUP Instead.